It’s PMQs day and after winning business support for his Brexit vision, Jeremy Corbyn may be tempted to taunt Theresa May on matters European ahead of her own Big Speech on Friday. With a big snow dump now due up north at the end of the week, No.10 is urgently looking at alternative options for the venue. 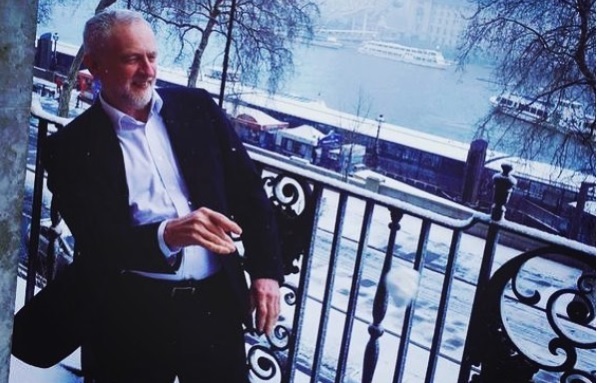 Corbyn, whose Instagram game is pretty impressive, was snapped chucking snowballs from the balcony of his Westminster office yesterday (two staffers took the pix). Will he lob a few curveballs at May today? In case you hadn’t heard, Brussels will today publish its first draft text of the withdrawal treaty. The 120 page document includes a ‘backstop’ plan to avoid a hard border in Northern Ireland by effectively creating a new border between Ulster and the rest of the UK. A senior Government source was firm overnight that was a non-starter: “The EU should be absolutely clear that the Prime Minister is not going to sign up to anything that threatens the constitutional integrity of the UK or its common market.”. Corbyn could certainly exploit SkyNews’s cracking scoop last night, revealing a private letter from Boris Johnson to PM that hinted that he could indeed live with a ‘hard border’ in Ireland. Sir John Major threatens more trouble on the topic with a speech today and many think Boris’s Camden-Westminster border joke isn’t funny at all. But in fact, he reflects a a hardening mood among Eurosceptics and the DUP on this very topic. Bernard Jenkin summed it up on Newsnight last night when he said: “If the EU wants a hard border, and they put stuff up at the border, that’s their problem. That’s not our problem.” And with the Irish economy dependent on frictionless trade, there are plenty who want to call the EU’s bluff. I was most struck earlier this month by the usually moderate David Trimble daring Dublin to impose border controls (in a little-noticed World at One interview). Ex Brexit minister told Today the EU was trying to ‘annexe’ Ulster.